As usual, Delray Beach will be the ATP’s first stop in South Florida. This year, the field is more spectacular than ever with 2003 U.S. Open title holder Andy Roddick and 2009 U.S. Open champion Juan Martin Del Potro gracing fans with their appearance. Moreover, former champions Marty Fish, Kei Nishikori, Xavier Malisse and Ricardo Mello will also take part in the festivities. The draw has been announced, here’ a closer look as to how this thrilling week may unfold. 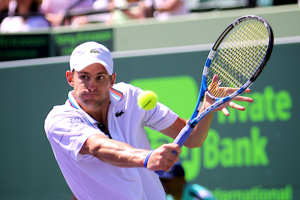 Roddick, the top seed, may have to face Janko Tipsarevic for the second consecutive week. This time, Roddick would battle Tipsarevic or 2010 finalist Ivo Karlovic for a spot in the semifinals. Third seed and wildcard entry Sam Querrey may be another threat to Roddick’s quest to the final. However, prior to a potential date with Roddick, Querrey may have to overcome either Nishikori, Russian Igor Andreev or the always dangerous Benjamin Becker in the quarterfinals. In the bottom section, 2009 titlist Fish is the second seed. Veteran Rainer Schuettler could present a grave challenge for Fish in the second round. Then, in the quarterfinals, Fish could contend with Radek Stepanek. Also, in Fish’s part of the draw are John Isner and Del Potro. These latter two just clashed in Memphis and could see each other again in the second round. American teenager Ryan Harrison has a terrific opportunity to get to the quarterfinals. But, in that round, Isner or Del Potro may await him. Consequently, Fish, Del Potro, Stepanek and Isner appear the ones with the truest chance to advance to the final. While the likelihood of an all American final exist, Roddick vs. Isner or Roddick vs. Fish, there are plenty of potential spoilers. Since returning from his wrist injury, Memphis seems to be a turning point for Del Potro. The Argentine looks to have regained some of the form and confidence which propelled him to the top ten. As a result, it would not be surprising to see two former U.S. Open champions Del Potro and Roddick duke it out for the ITC title. Click here for a complete look at the draw as it appears on the ITC tournament website. The field of competitors scheduled to appear at the 2011 Delray Beach International Tennis Championships in February has shaped up to be the strongest in the tournament’s history. The draw is headlined by former US Open Champions Juan Martin del Potro (2009) and Andy Roddick (2003). Joining Del Potro and Roddick are past Delray Beach ITC champions Marty Fish, James Blake, Kei Nishikori, Xavier Malisse, and Ricardo Mello. The tournament will also host a stop of the ATP Champions Tour event with John McEnroe, Mats Wilander, Pat Cash, Todd Martin and Mark Philippoussis scheduled to play. DELRAY BEACH, FL (January 20, 2011) – Former Delray Beach International Tennis Championships (ITC) champions Xavier Malisse, Kei Nishikori and Ricardo Mello, along with 2010 runnerup Ivo Karlovic and 2007/2008 runnerup James Blake have signed up to play in the ITC’s 19th annual ATP World Tour event from February 21-27 at the Delray Beach Stadium & Tennis Center. Also committing to the draw: 2009 world No. 12 Radek Stepanek and Janko Tipsaravic, who played a hero’s role in leading Serbia to the 2010 Davis Cup title. The group joins a pair of US Open Champions – Andy Roddick (2003) and Juan Martin del Potro (2009) – as well as current Top 20 players Mardy Fish and John Isner – in giving the ITC arguably its best draw in history. Malisse, the winningest player in ITC history, reached the Chenai final earlier this month. The 31-year-old is a three-time champion (2 singles titles, 1 doubles title) and has reached three other singles finals at the ITC. Nishikori’s incredible run in 2008 as an 18-year-old made him Delray Beach’s youngest champion, and Mello will long be known for winning the 2004 title following one of South Florida’s four hurricanes that season. Karlovic enjoyed an exciting run to the ITC final last year that included a tournament-record 89 aces, while Blake, with an 11-5 record in this tournament, received a wildcard to play this year. Stepanek has played in 11 career ATP World Tour finals – winning four – and was the Delray Beach doubles champion in 2004. Tipsaravic owns an impressive record vs. Top 10 players, and his win in the decisive 5t rubber in last year’s Davis Cup semifinal propelled Croatia to the final. The tournament’s ATP Champions Tour event, featuring John McEnroe, Mats Wilander, Pat Cash, Todd Martinand Mark Philippoussis, will kick off the Delray Beach ITC on Friday, February 18 at the Tennis Center. 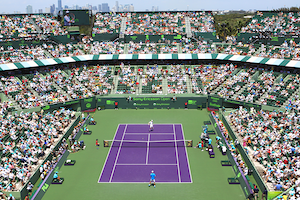 Fans buying tickets on Monday and Tuesday, February 21 and 22, will see both ATP World Tour and ATP Champions matches. Baron also announced a ‘blockbuster’ Tuesday evening session that will include Roddick’s opening match in addition to the ATP Champions Tour final. The world No. 8 is expected to be the top seed in the ITC’s ATP World Tour event. Individual session tickets range in price from $15 for grandstand seats to $85 for box seats, while a wide variety of tournament packages are available from $200 to $490. A limited number of ON-COURT “Best Seats in the House” remain, and there are unique “Fan Experiences” also available for purchase. Here is Delray Beach’s 2011 draw: Kevin Anderson (RSA), Igor Andreev (RUS), Benjamin Becker (GER), Julien Benneteau (FRA), Richard Berankis (LTU), James Blake (USA), Dustin Brown (GER), Brian Dabul (ARG), Juan Martin del Potro (ARG), Ivan Dodig (CRO), Mardy Fish (USA), Teymuraz Gabashvili (RUS), John Isner (USA), Xavier Malisse (BEL), Adrian Mannarino (FRA), Ricardo Mello (BFA), Kei Nishikori (JPN), Bjorn Phau (GER), Michal Przysienzny (POL), Andy Roddick (USA), Rainer Schuettler (GER), Florent Serra (FRA), Radek Stepanek (CZE), Janko Tipsarevic (SRB); Balance of 32-player field will be filled by 4 qualifiers, 2 special exempts (at ATP discretion) & 1 wildcard. Visit the Delray Beach ITC website www.YellowTennisBall.com to purchase tickets. For more information, please call 561-330-6000.